A black and white African colobus monkey was born at the Dallas Zoo in June 2016. The baby will be named once its gender is determined. 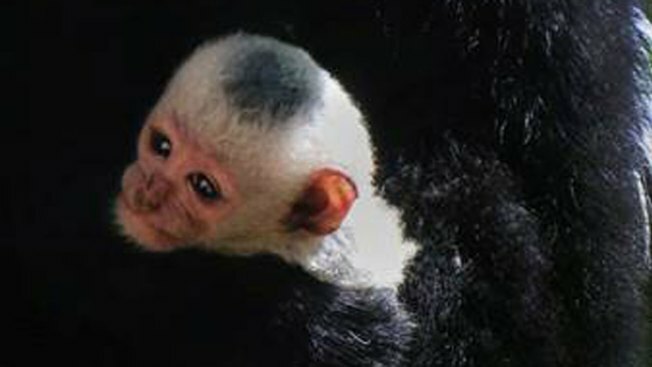 The Dallas Zoo welcomed a new baby monkey to the Primate Place last week. Unnamed baby colobus monkey born to parents LaBounee (pictured) and Kirby in June 2016. 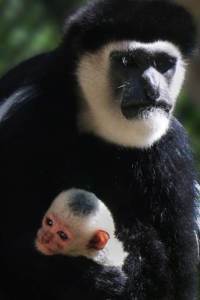 The unnamed baby colobus monkey was the eighth baby born to parents LaBounee and Kirby at the zoo. The baby's gender is not yet known, and will be named at a later date. The black and white African primate can be seen in Primate Place along with its three siblings, including 14-month-old big brother Pamba and 2-year-old sister Anna, with whom the zoo said is "bonding beautifully with the baby." The zoo said the baby's pink face will slowly turn black and that its white hair will change into the "iconic black and white coat." The colobus monkey, while not endangered, is a threatened species. In the wild, colobus monkeys can live up to 25 years; in captivity they can live 30 or more years.